07. Trouble In The A.M.
Picture this: in a story of foul play with a strong hint of irony and exaggeration, the flick deals with Henry -our leading character- who is caught in the middle of several seedy transactions… This is the soundtrack to "Duck Soup". 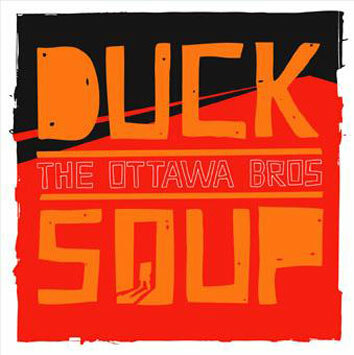 The Ottawa Bros shared a similar interest in music and film. There is a common, easy to define thread here: ranging from a retro mood emanating from the vault -that '60s and '70s sound-, to more neo funk beats and attitude-filled riff-o-rama, that stay clear from the pop song formula and other fixations. What is stitched-up here, is a crusty blend of percussive breaks, afrobeat grooves, cinematic scapes and even the occasional psychedelisized swing to pseudo funky/rocky/jazzy flavors. Dj Oxocube, the extractor, ties it all together for the soundtrack. A hideous amount of editing, processing, programming (and de-programming) was involved in the process. No cheese here... just "Duck Soup".